Industrial production accelerated by 8.5% in November, significantly beating the market consensus of 5.7%. This represented a moderate slowdown from October's annual growth rate of more than 10%, although the dynamics in October were unlike November due to a higher number of working days. Taking this quirk into account, October's industrial growth was just 5.1%, meaning November's industrial growth was stronger and well above the current 2017-average of 6%. Industry in November has traditionally been driven by the manufacturing industry, which accelerated by 8% year-on-year. However, energy production also accelerated by a robust 16% YoY, mainly due to a lower base amid shutdowns in nuclear power plants a year ago. As such, low-weight energy sector production contributed to the total November industrial growth by almost two percentage points. New orders in November increased by 3.3%, driven more by domestic orders. However, the growth of new orders in car production remained weaker, falling by 5.6% YoY. The average dynamics of new orders in this most important domestic industry segment has been weaker in 2017. New orders grew by just 2.5% on average, compared to double-digit growth in the past few years. Based on forward-looking indicators such as PMIs, industry confidence and foreign demand, conditions in the domestic industry should remain favourable. Still, year-on-year dynamics may weaken this year due to a high base. The question remains the deceleration of car production, which is affected by the high base, high capacity utilisation, as well as the lower dynamics of new orders. 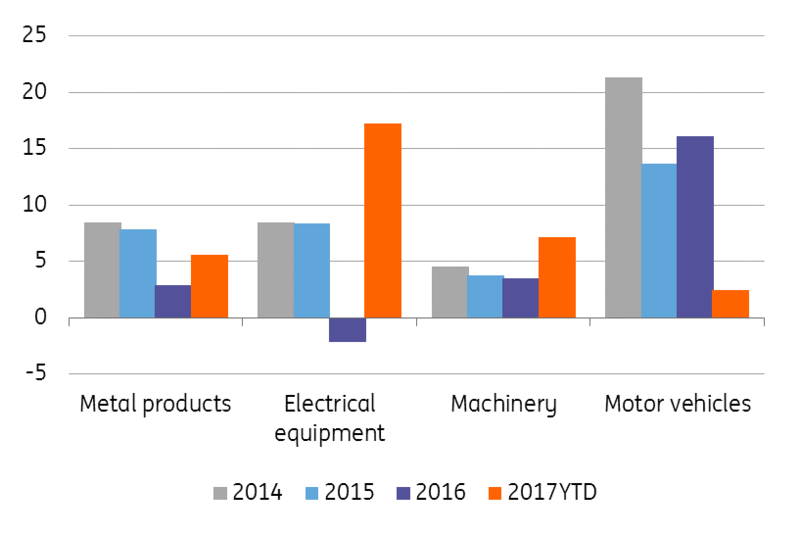 From this reason we assume the Czech industry - after its 6% growth in 2017 - will decelerate this year to slightly below 4%.